Make a stunning illuminated shadow box from card stock. This tutorial follows me assembling the 2018 Heart Tree Star Shadow Box but the steps are the same for other star shadow boxes I have designed including the Deer in Forest and Horses in the Pasture shadow boxes. This project uses card stock and mid-level construction techniques to assemble the 11" tall x 3" deep shadow box. It includes 5 internal layers and locations for optional LED fairy lights to provide a back glow in the sky. It is perfect for mantle, shelf or hall table. Note: This tutorial is not for the Star Nativity Shadow Box. Complete the tree: The Heart Tree Shadow Box includes an alphabet on Layer 2. You should ungroup that and move the custom initials onto the tree inside the heart. You can duplicate them if needed. These need to be attached in place depending on the requirements of your choose software. Silhouette people can group. Cricut folks will need to attach. There are fine lines. It is best to have a good blade and mat. I use the Premium blade. Making the Deer in the Forest Shadow Box? Click here for that layout. Making the Horses in Pasture Shadow Box? Click here for that layout. Hint: There is a lot of cutting for this project. I started by cutting all the parts for the star frame (red below). As I was assembling the star frame I was cutting the side braces (10 times- 2 per page). As I was folding those and applying the Score-Tape, I was cutting the 6 remaining parts. It worked well. 5. Build the star frame:This first video demonstrates the steps for completing the star frame. It is the same for all star shadow boxes. 6. Build the layers insert. Put the star frame to the side and follow the Part 2 video for building the insert stack. There a several diagrams I created to help with this process and I refer to them in the video. 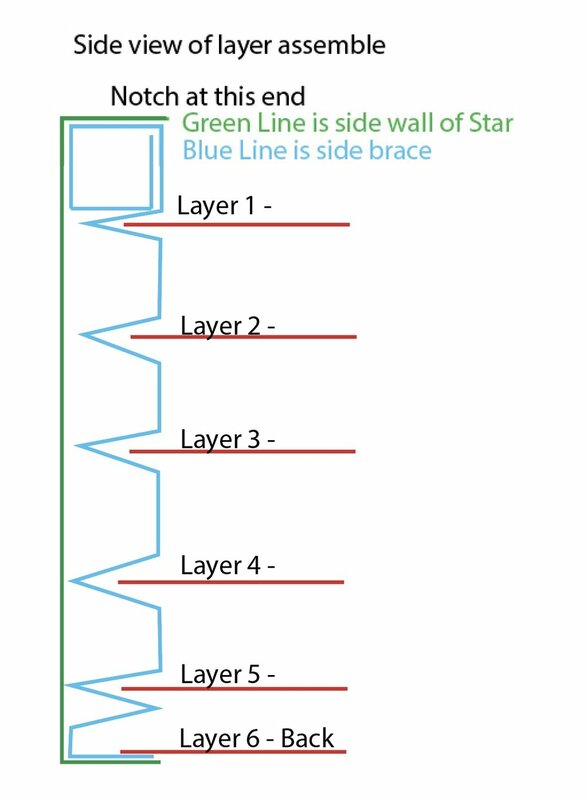 The first is this side view diagram of the folds of the side bracket and how the various layers will be inserted. The second diagram is this one showing the numbers on each segment of the side bracket. These numbers correspond with the numbers I use in the video. Also note, each segment that should have Scor-Tape added is marked in pink. Each different shadow box has unique prep for the layers. Making the Heart in the Tree Shadow Box? The prep of the heart (adding letters) on layer 2 is explained above. Adding the support to Layer 3 is covered in the video below. Making the Deer in the Forest Shadow Box? Theres are no special add ons to the layers. Making the Horses in Pasture Shadow Box? You need to add the details on the horse. Click here for those details. 7. Add the LED Fairy lights. 8. Part 4 - Star Shadow Box Finishing Up! This area is where I make notes on things learned as more people make the shadow boxes. We can learn from each other's hints. After the making of the videos I continued to make more shadow boxes and I have adjusted some things. You may or may to want to add these adjustments. Covering the gap in the layers. There is a file for a small rectangular insert used to cover the gap in the center of the bottom. For the Heart in Tree Shadow Box I cut 9 of those and used them to cover the gap in the first 3 levels of the bottom but also of the left and right sides. As I was doing the final photographs I found those gaps visually distracting. It was an easy last add-on. Here are two other star shadow boxes that are constructed using these same techniques.